We arrived in Auckland at 5am on New Year’s day having completely missed New Years Eve (due to the time zone change), as we left Santiago in the evening on the 30th Dec. Quite strange to loose a day completely, especially the 31st December, but we decided to make up for it immediately by going for a run in the park and then having Champagne for breakfast with our bowl of muesli in time to celebrate the New Year in Europe as a result of the 12-hour time difference. 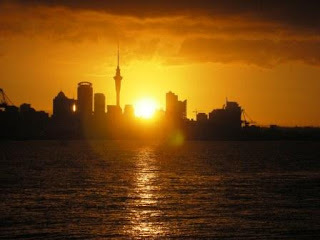 Auckland is a pleasant port town and a capital of New Zealand’s sailing. 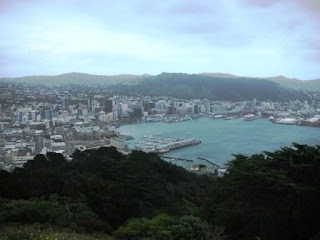 There are many good (and expensive) restaurants along the seafront in the port and typically for New Zealand plenty of opportunities for bungy jumping, sky-diving and other adventures. We decided to spend our time at a more leisurely pace with a visit to the ASB women’s tennis tournament, a nice dinner on the seafront a visit to the Antarctic Encounter aquarium and an afternoon’s swim at an open air pool. After 2 days in Auckland in a good hotel it was time to buy a tent get a rental car and start our trip down south which was to end in Wellington. The first stop on our way was the campsite at Waitomo Caves. The region has over 800 caves with many companies offering cave exploration trips involving abseiling, black water rafting and other caving adventures. We went for a trip to St Bernard’s cave with a 100m abseil into a dark cave with torches, scrambling through openings full of stalactites, stalagmites and other beautiful rock formations and a ride down a Flying Fox at the end. After St Bernard’s cave we went to see the main Waitomo Cave with chambers full of beautiful glow worms. 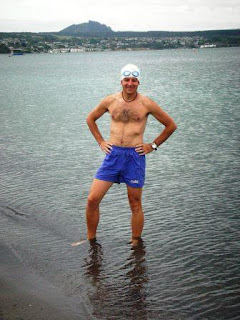 While browsing the internet one day I discovered that the Port of Touranga Half Ironman was going to take place while we’re in New Zealand. Of course I demanded that we go there immediately! 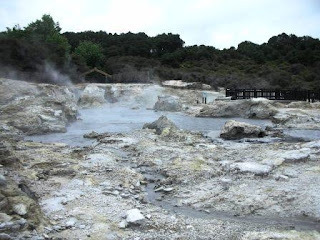 Rotorua is the center of the thermal volcanic region with many places offering hot volcanic spa as part of the thermal experience. Hells’ Gate sounded like the place to take a dip in the thermal spa and we had the full package including a mud bath and a sulfuric bath. Interesting and quite relaxing, but we couldn’t get rid of the smell of rotten eggs from the car for hours. Taupo The drive from Rotorua was only about 70km and we decided to take the scenic route and drive via Reporoa and scout out the Ironman New Zealand bike course. The bike course appears relatively flat with only one significant climb, but the road surface can probably make it quite slow. Taupo is a nice holiday resort on the shores of Lake Taupo. Typical relaxed Kiwi atmosphere with a lot of pleasant small cafes and plenty of places that organize all sorts of adventure activities from Zorbing (quite a weird thing, really), fishing, trekking, mountain biking though to skydiving and of course bungy jumping. We decided to take it easy and just run along the IM run course, swam in the lake (part of the IM course) and organized our trekking to the Tongariro Alpine Crossing. The small town of Turangi is the gateway to the magnificent Tongariro National Park, full of volcanos and interesting trekking options. We wanted to do the Tongariro Crossing, voted the best 1-day walk, but unfortunately the weather has deteriorated very quickly and the trek was closed for safety reason’s with very poor visibility, rain and high winds. 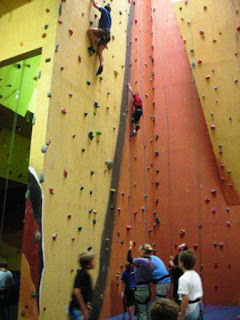 Instead we went for indoor rock climbing with a 30mt wall, which was great fun. We wanted to spend the last 1.5 day’s at Wellington, but unfortunately due to flooding as a result of all the rain we has to stop overnight 2 hours from Wellington and didn’t get to the city until the afternoon the day before our departure. The city seems pleasant enough, although we didn’t have too much time to explore. In the evening we went to the Te Papa museum to see the wale exhibition and unexpectedly bumped into Kerry & Dave (from our Patagonia trip), so we had some drinks at the Brewery and then headed for the night to our campsite at Lower Hutt. The next day it was time to pack the bags and head for the airport to catch our flight to Melbourne. We had just enough time on the way to drive to the top of Mt Victoria, which offered spectacular views over the city. Can’t believe that you missed the New Year’s celebration!!!! Have lots of fun in Australia. Looking forward to see the next photos.